Are you in my head! The theme this month must be focus and commitment. I have had to take my eyes off disappointments and discouragements, and refocus them on my goals, dreams and visions. When did my focus shift? Need to be aware of that and guard my heart and mind! Thanks for sharing this! SO INSPIRED!! Glynis – I’m so glad that this hit home for you too. Achievement is a head game indeed. I’ve always been a very resilient person but sometimes I just need someone to “throw me a bone” — a little bit of encouragement that our long, long hours and hard work will at some point lead to something. I shared my feelings because I’m sure that there are others who need these two inspiring examples as well. So let’s dust ourselves off and get back to the business at hand. 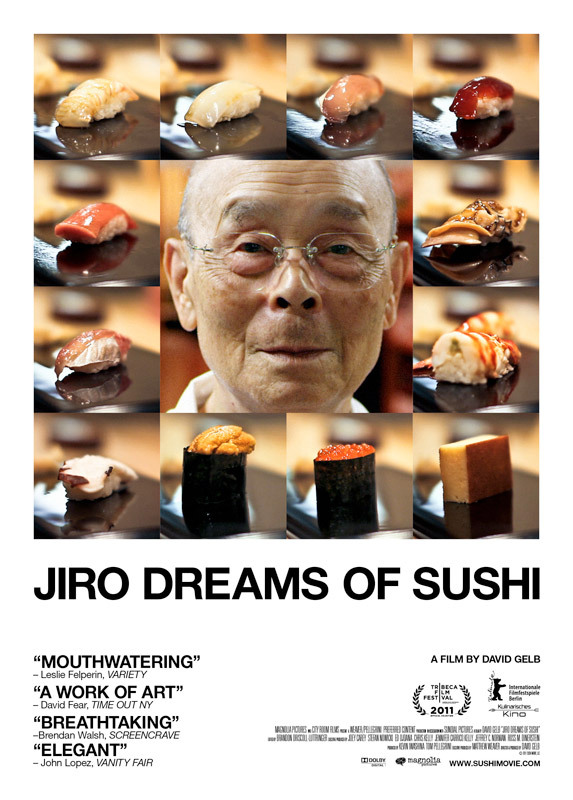 The Jiro Dreams of Sushi movie looks fantastic! I almost feel sorry for his son, though, feeling that Jiro’s “ghost” will always be watching, and although Jiro believes “you should fall in love with your work,” it seems as though his son’s future is preordained. I like the concept of wabi-sabi and its ties (in my mind anyway) to a facet of the modern quilting movement–aberrations can/should be embraced. A really inspiring post and something we have to keep reminding ourselves of. It’s so easy to focus on popularity (or lack of it) as the goal, rather than just the work, process and heart. When I worked for a 300-person architecture firm there wasn’t the pressure to “have a following” that there was once we started FunQuilts/Modern Quilt Studio. I’m not an extrovert and I’m not a master of social media so it sometimes feels as though the work is secondary in the minds of others when we want it to be the only factor in whether or not we get more fabric lines, book contracts, teaching gigs, etc. I wouldn’t focus on it at all if it weren’t a topic in every discussion we have with decision makers we work with. When we started in 1999, none of that mattered and I miss those days. This film showed in our Film Festival last year – it truly is a film worth seeing for the dedication Jiro shows towards his “art”. Now I will be interested in seeing Mirror, Mirror that you have recommended. These movies are definitely on my “to see” list. Thank you for an inspiring post and one that kind of hits home a bit this week as I pursue next steps in my business/career. Weeks, I wish I could convince you that what “they” say doesn’t matter, and don’t compare yourself to others, and am sure many times you successfully ignore the critics and the voices including the new social media. My Mom is an artist and too many times I compare myself to her…she is also so good at so many things, she’s very creative and determined even at age 81. Sometimes a feel so inspired by her and other times I feel discouraged, though she’s supportive of my efforts. I do feel inspired by you and Bill, not to be like you, but to live a richer and more creative life! Thanks for the movie recommendations. Lisa, I hate to be the bearer of reality but what I’m talking about is not whether or not we’re popular for the sake of being popular. I’m talking about whether or not quilt shop owners like our fabric enough to order it, whether or not our books sell, whether or not someone thinks that if they book us for a class or lecture that we will be able to attract enough of a crowd to make it worthwhile for them. This affects our ability to stay in business and our livelihood. You may not be aware of it but this is how people in our position are talked to and about. A sales rep for a fabric manufacturer once admitted that he didn’t even show our line of fabric to shops because he didn’t think we had a big enough following to get the sales. We’ve been told, “We’re looking for someone with a bigger following” and occasionally, “You clearly have a big enough following to make this work.” It’s about whether or not we get the opportunities to do the things that we want to do. It doesn’t affect how we get inspiration but it dramatically affects our future as a business. Weeks, I guess I mixed up 2 things in my comment – my apologies – excuse me while I extract foot from mouth. You and Bill do seem very secure in your sense of self and abilities, but at least some of the people with the power to get your books and fabrics to the consumers seem out of touch with us (quilters, consumers). The personal insecurity is my issue perhaps brought to the fore by the discussion of the sushi master movie! I will admit to being naive about the business world having so little personal experience in it and with the good fortune of a very bright, capable husband/life partner who supports us by work in the software industry. In my little corner of the quilt world, a few of the LQS stock your books and in my Modern Guild people know who you are and value your work. Ahh. Thanks for clarifying that. Quilt shop owners are as varied as the rest of the population but understandably are worried about taking chances on things they don’t like or understand — hence the salesman’s comment to us. I think that you’d be surprised at some of the drama that goes on at Quilt Market and behind the scenes. It has shocked me more than a few times so it’s not always easy to deal with the business side of it. I appreciate your vote of confidence in us and thank you for cheering us on. I really want to see the sushi movie; it’s 90 miles away, though……guess I’ll wait for DVD. There are some disadvantages about living in the country-90 miles from Northern Virginia and bright lights/big city things like movies, great restaurants, concerts, etc. But it’s not that far a drive if we really want to get there.